Finding an elegant yet relatively inexpensive bridal favor can be a challenge. If you are looking for something classy and beautiful to give as a wedding favor that won’t cost you an arm and a leg you may want to consider heart shaped crystal ornaments. Here are some ideas on how you can use these beautiful ornaments to create lovely favors for your bridal party. Crystal itself is classy, elegant and dazzling. The play of the light off the crystal creates a magical display, making crystal ornaments a wonderful way to dress up any table or gift. The great thing about crystal ornaments is that they are relatively inexpensive, yet they look luxurious and are substantial enough to work as a favor on their own. If you prefer, however, you can also incorporate them with other small gifts to create a one-of-a-kind wedding favor. For a practical yet fun favor, try hanging a heart shaped crystal ornament around a package of gourmet coffee for each of your bridal party. They can hang the crystal in their window to catch the light while they enjoy a relaxing cup of coffee. Not only that, but the addition of the crystal can make even a rather plain package of coffee look elegant and exotic so it is a great way to keep your costs down without looking cheap. While crystal heart ornaments are a great choice for a wedding favor since they symbolize love, if your wedding is during the winter consider choosing crystal snowflake ornaments instead. These 3-dimensional ornaments are intricately designed and are a unique and lasting gift. To personalize your favors, consider getting the crystal ornaments engraved with either your wedding date, with the name of the person receiving the favor, or with a lovely sentiment that will create a lasting memory of your wedding. There are many different styles of crystal ornaments that can be engraved and the personalization will make them even more special to your bridal party. 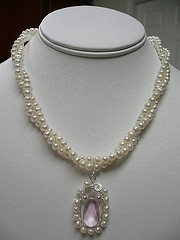 This entry was posted in Crystal Glitz and tagged bridal, crystal, jewelry, sets, wedding on August 18, 2009 by admin.